If a coffee fanatic decides they want to open up a coffee shop somewhere, odds are they’ll have to end up Googling “liability insurance” at some point — and trying to navigate the complex legal web to get all of that nailed down before they even sell their first iced latte. Inaki Berenguer instead hopes they’ll stumble upon CoverWallet in that Google search, which streamlines the process of setting up commercial insurance for a small business. The company is trying to take another step now by saying it will create an open-ended tool that allows third parties to plug directly into its services, giving small businesses a way to pick up commercial insurance while they are going through the flow of another set of SMB management software. All of this is geared toward ensuring that more and more users are able to start tapping the service, which allows it to pick up additional business — and data — even if it means partially handing off the branding and user experience to another service. CoverWallet is much like what Berenguer explained in his dream scenario when he was moving his last company into an office. The insurance policies are personalized for restaurants, startups, retail stores, contractors, or various other types of commercial insurance products. Users input their business information, and then are able to pay for the policies — up front or in monthly installments — and get their policy set up in short order. If that doesn’t work, CoverWallet also has a team of agents to cover the rest of the questions they have, and users can modify any of those policies whenever they want. But in the end, it may be that users are looking to keep things simple – especially if it’s a small- to medium-sized business that isn’t the kind of technically savvy ones you’ll often find in a major metropolitan area like New York or San Francisco. While CoverWallet looks to simplify the whole process of getting commercial insurance, which can be a major roadblock to getting something as simple as a coffee shop off the ground, integrating into other tools and making the whole process more and more seamless ensures that it’ll be able to keep that flow of businesses coming in — and those businesses may eventually start to spread the word on their own. There likely isn’t much stopping the larger insurance carriers from offering a similar sort of plug-and-play API. But Berenguer said building a whole aggregation across all of those insurance providers, and then giving that pipeline to customers as they look to pick up insurance through another SMB tool like Gusto (though Gusto isn’t one of the clients, Berenguer said), gives them enough of a compelling argument for those employment suites to bring them in. 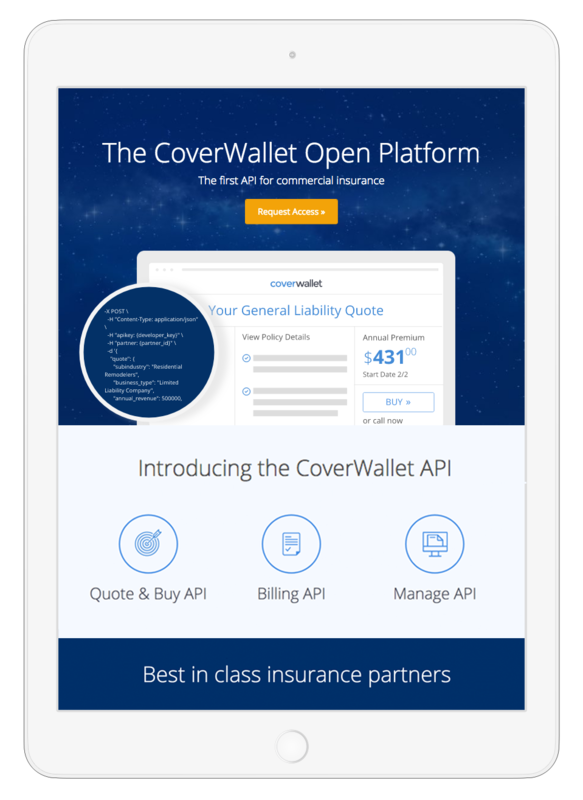 Certain providers may only offer certain kinds of policies, or cover certain geographic regions, and CoverWallet hopes it will make a good enough case that it can cover all those gaps.